Be it this or any weekend, if you’re thinking what to do, go through this itinerary, and pamper yourself by the beach! Mahabalipuram is about 50 km from the city, along the East Coast Road (ECR), so get in your car around 9am or hop on a bus (T29, 589, 1A, 588) and drive by iconic spots like Juhu beach, Cholamandal Artists' Village, DakshinaChitra, Tiger Caves, MGM Dizzee World, and VGP Universal Kingdom, and Muttukadu Backwaters (you can go boating here!). Put your phone on silent mode, look outside the window or feel free to pull over and explore these places! Stop at Sangeetha and hog on their delish dosa, idli, vadai, and chapati. Get a ghee podi dosa and flush that down with some hot filter kaapi. Fill yourself up with a poori or paratha and a lassi. Want a change from veedu breakfast menu? Try sandwiches, French toasts, and breakfast combos at Tryst Cafe. From Jet Skiing and boating to ATVs and paintball, Offroad Sports ECR gives you lots of options. You can pick their Woods Ride to get away from city traffic and ride on a rough terrain. Kick it up a notch by trying the thrill ride, driven by experts, where you can experience some fastest off-road machines. Oh, and these guys are introducing archery and rock climbing soon! Right after you cross Nithya Kalyana Perumal Temple, you will find a stretch with pine forests, which lead directly to the private beaches. Stop here for a picnic, or a romantic walk with bae. And you can click some super lit selfies! Price: INR 400 (ATV), INR 350 (Paintball for 30 min). Prices vary depending on the CC of the bikes and number of laps. Get lunch at ECR Dhaba, they have super yum Indian and Chinese food. Go all out with one of their mini platters (Tandoori Chicken, Chicken Tikka, Garlic Chicken and Fish Tikka), or pick some veggie dishes like Dal Makhni, Aloo Gobi, and fried rice off their menu. They have a special seafood menu too, with a variety of fish like Pomfret, Karimeen, paarai fish, and green fish, so try and control your excitement while you browse through your options! Go on a catamaran ride on Kovalam beach through Temple Bay Resort and experience being in the middle of the ocean, literally. Remember scenes from Hey Goodbye Nanba? If you’re a swimmer, brownie points, but if you’re not, don’t worry. You will have life jackets and the fishermen annas will help you get into the water. If the tide is good, you can see the remains of gopurams (domes) of several temples (from the ancient era) buried under the ocean. You can float and bask under the sunlight for more than 30 minutes while a motorboat pulls you across the water with a rope! You can also book Catamaran rides with annas from the fishing community starting INR 250. Visit the shore temple, a UNESCO World Heritage Site that's right by the beach. Climb up the 142 spiral stairs of the candy-striped red and white Lighthouse at Kurumkal hillock. The breathtaking view of the blue sky, waves, and the view of the city will make your evening. Drown in the beauty of Mahabalipuram, right from the tiny, picturesque roads where you can take great Pinteresty pictures to read a book by the beach. Soak your toes and catch some waves by the beach, or just lay down on your blankie and get that amazing tan. And if you're with your squad, you can indulge in a game of volleyball. Kite flying is another option as well. You can rent a bicycle and ride around Kadumbadi village, close to Mahabs, known for the sculpting and pottery communities. 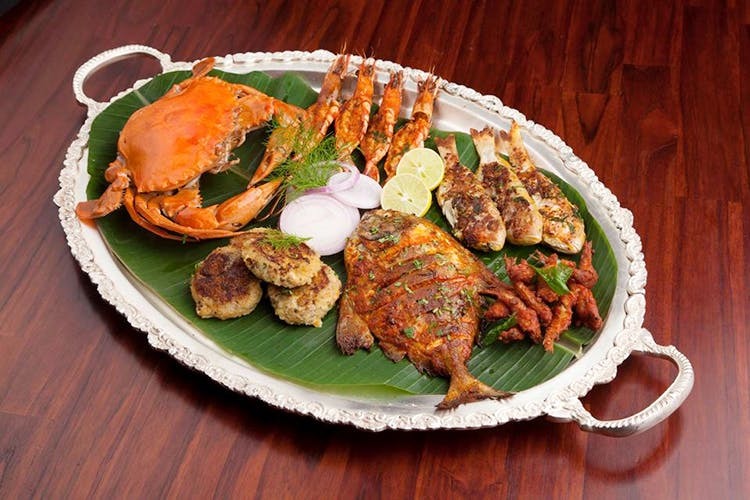 You can grab dinner at Moonrakers, which is known for their seafood and interiors all through Chennai. Fish curry, prawns, fruit bowls, fluffy pancakes, you won’t be disappointed here (they have great beer). Chinese lanterns, wooden tables, and huge cartwheels at the entrance, this place is perfect to hang with your gang. But, if you’re a vegetarian, you may not find many options at this place. Already been to Moonrakers? Check out Santana, a low-key restaurant right on Mahabs. Rustic interiors, thatched roofs, and an amazing view of the sea, Santana will be your happy place. Fried tawa calamari and prawns, their famous butter garlic sauce, and veggie options will fill you up quick! You can BYOB to this place, too! Check into Vinodhara Guest House, an Airbnb located in the heart of Mahabalipuram. A two-minute walk from the beach, a five-minute walk from the town centre, you'll be in the hub of the tourist attractions (Shore Temple, Krishna's Butter Ball, Pancha Rathas, and the Lighthouse). The amenities include washer and dryer, Wifi, free parking, and complimentary breakfast. Beach lovers, indulge in a number of water sports from kitesurfing and kayaking to ocean swimming and stand-up paddling at Kovalam Beach. Take a surfing lesson at Bay of Life surf school starting INR 1,500. A bit steep, we know, but the 1.5-hour sesh will leave your adrenaline sky-high and give your body the ultimate workout. All out of money? Been there, and we recommend you dive in and swim in the quarry just five minutes from the beach. Here, it will just be you, the water, and the sky. Crack open a beer and watch the sunset. While driving back from Kovalam, stop by Madras Crocodile Bank Trust to see some baby and adult crocs up close. And if you're there before the park closes, you can see a feeding of Jaws, one of the largest crocodiles in the park! You can see the feeding of other animals like house water birds and turtles, and check out the nesting beach for Oliver Ridley Sea Turtles! If you fall in love with the crocs, stay for the night safari, where you'll see all the action! Price: INR 30 (for children under 10), INR 50 (for adults), night safari tickets are INR 100 (for children under 10) and INR 200 (for adults).